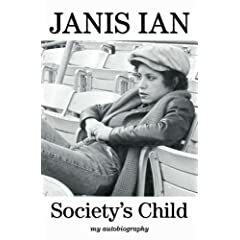 Before I read Janis Ian's Society's Child: My Autobiography, I have to admit not being familiar with either the artist or her music. As I listened to the two-disc greatest hits collection, Best of Janis Ian - The Autobiography Collection, released in conjunction with the book, I was amazed at how many of her songs were tethered to memories of my own childhood and also how versatile a songwriter she is. Society's Child could easily have been the story of gossip, excess, and tragedy, but Ian applies her songwriting skills to prose masterfully as she shares the struggles she has faced, as well as the ultimate victories. "Ian is a natural prose stylist with a real knack for pacing and the telling detail. What might have been a dreary catalog of woe is instead a juicily entertaining look at an unusual life in show business." I have what my partner calls "zero auditory closure," which means when I hear sound of any sort - be it a song, radio talk show, or just wind in the trees - part of me shuts down to listen. That's great as a songwriter, but not so wonderful as a human being. It means I spend a lot of my time walking around looking stupidly vacant, because I'm actually listening in my head. When there isn't much sound going on around me, or it's familiar sounds (my refrigerator, the dogs snuffling), I usually end up listening to music in my head. While I was writing my autobiography last year, some songs kept recurring, over and over again. I can't figure out whether that's because they're comfort songs for me, or because they're songs that challenge me - certainly I do wish I'd written all of them myself!